A words of wisdom game for a bridal shower is a popular pre-wedding activity. You can get ideas from existing word games or tailor a homemade gift game just for the bride. This fun game is always a crowd pleaser! You can create your own version of a words of wisdom game for a bridal shower. Explore examples others created or come up with your own ideas for a fun word game sure to entertain everyone. As guests come into the party, have a small table set up near the door (it could also be by the present area). Leave a variety of nice pens and wedding related notepapers out. Type up instructions, or greet guests and ask them to write words of wisdom regarding love and marriage onto the notecards. Then place the cards into a wishing well. Just like a kitchen shower or around the clock shower, you can make a "words of wisdom" themed shower. When mailing out bridal shower invitation, include a card asking guests to purchase a gift that they wish they had the wisdom to buy before they got married. Then include a short tag for them to include in the packaging, explain their choice. Turkey baster-Not all women are graced with the wisdom to know when the first Thanksgiving turkey is cooked. Negligee set-Even the "smartest" man may need some help knowing the right time for romance. Give him a clue using this wise gift! Address book-Keeping all of your family and friend's addresses after sending out the invites is much wiser than hunting them down six months later for Christmas cards! Before you send out your themed shower invites, consider the bride's family and friends. 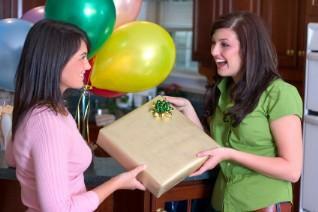 In some circles, it is considered a faux pas to suggest bridal shower gifts to purchase. However, if themed showers are common in your area, feel free to host one. Make your words of wisdom shower activity the main attraction. Set it up by making notecards up that have headings, like "In the Bedroom," "In the Kitchen," and "In the Garage." Randomly pass them out to shower guests. Tell them they must write down two pieces of advice relating to that room. After about ten minutes, have everyone read aloud what they have written. Make up a "mad libs" type word game for your bride-to-be. If you are creative or a good writer, you can make up a little poem for the bride, giving her advice on marriage. Have the original poem printed on one side of a nice paper. On the other side, eliminate certain words. At the shower, ask guests to throw out words relating to the honeymoon. This can get a bit naughty, so be prepared! Then fill in the blanks. Read the new poem out loud, followed by your original. The guests and bride will surely get a kick out her new "raunchy" advice! Once the activity or game has been finished, remove yourself while guests enjoy cake. Then you can add the finishing touches to the words of wisdom keepsake, such as sliding the cards into the album or adding the author's names to the cards. If you truly want to make an impression on your bride, take digital photos of the guests doing the words of wisdom activity. Additionally, get a photo of each guest, and of the bride opening that guest's gift. Use a printer to quickly print off the photos. Place the guest's photo, the card with words of wisdom, and the present photo into a scrapbook album that you made prior to the wedding. The bride-to-be will be honored with the present.